This soup will leave all the family looking for more! 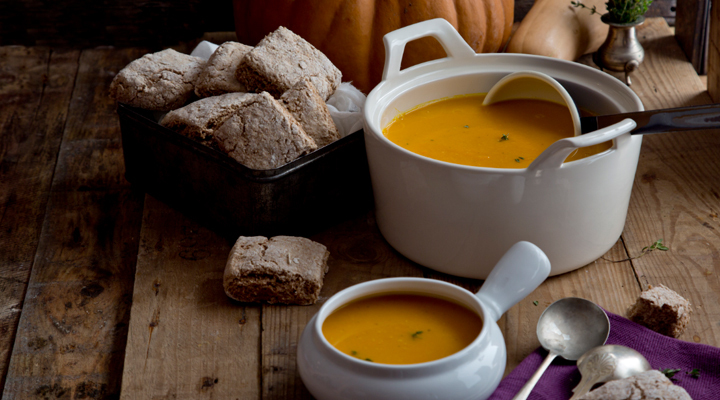 Why not double up this recipe to have enough soup for the week or to stash some in the freezer? If using a pumpkin, we always leave the skin on (but if using a butternut squash, do peel it, as the skin can be bitter). Just give it a good scrub, then chop it in half, remove the seeds and cut into bite-sized pieces. Warm the oil in a large family-sized pot set over a medium to high heat. Add all your veg along with the bay leaves and salt. Let the veg sweat for 7 to 8 minutes, then add the red lentils, water, grated ginger and the leaves from the sprigs of fresh thyme. Bring to the boil, then reduce to a simmer for 15 minutes, stirring regularly as lentils like to stick to the bottom of the pot. Taste and make sure the lentils and the pumpkin squash are cooked through. Remove from the heat and remove the bay leaves, then blend using a stick blender or a food processor until the soup is smooth. Ladle into bowls and garnish with flaked almonds and chilli flakes. If you have time, toast the almonds on a hot, dry pan for 3 minutes, which makes them even nicer. Serve with some good brown bread.